Since I was a teen-ager I’ve been strongly sensitive to the horrors and the insanity of the Holocaust thus, during my recent trip to the German capital I couldn’t miss seeing the Berlin Holocaust Memorial. 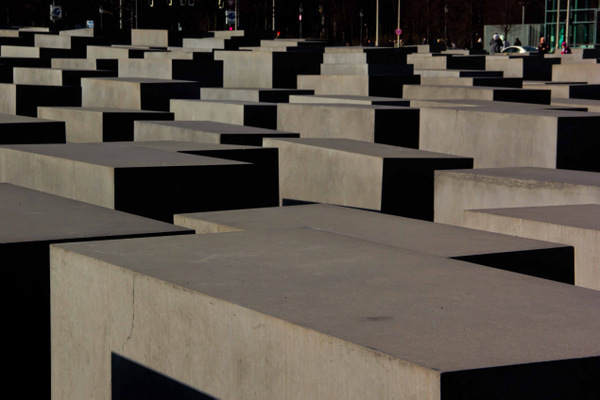 While walking among the stelae of the Berlin Holocaust Memorial I was surprised by my unexpected reaction: intellectual admiration, but no strong emotions. Before visiting, I did know very little about the Berlin Holocaust Memorial and deliberately avoided reading articles as I wished to experience it without being biased. I wanted to let my emotions flowing freely. I wished to listen at my heart and not at my brain. 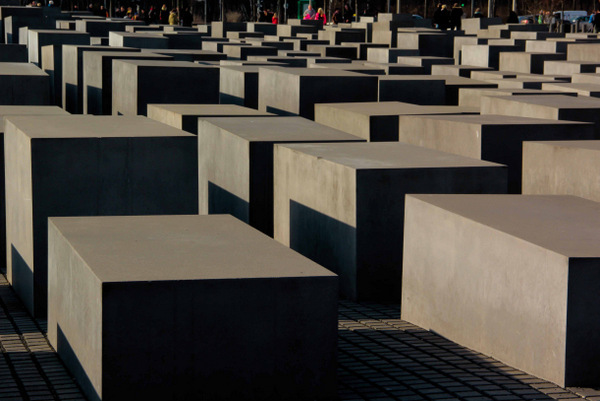 As I walked among the 2,711 concrete stelae created by thew American architect Peter Eisenmann I felt admiration and interest for the creative concept and the architectural beauty of the Holocaust Memorial, still… no strong emotions. My brain was impressed, but that was it. How different I had felt the year before, when totally by chance I came across Gleis 17, the Memorial remembering the deportations of thousands of Berlin Jews to Theresienstadt and Auschwitz. Away from the main touristic routes and a little hidden in the woods of the Grunewald district, Gleis 17 aroused strong and deep emotions that I didn’t feel at the Berlin Memorial to the Murdered Jews. I need the power of silence to let my heart speak and my emotions flow. 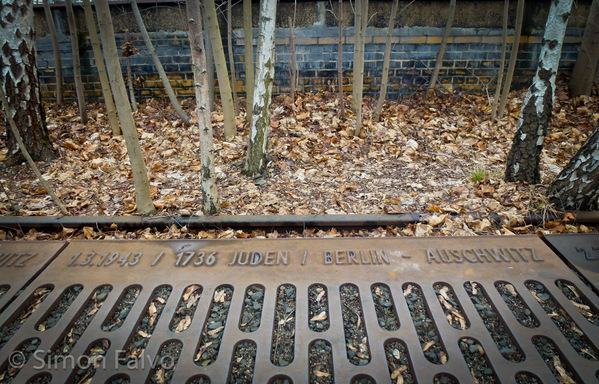 I followed the line of simple plates bordering the tracks, showing a date, a destination and the number of jews deported. Walking in the stillness surrounding the Gleis 17 Memorial, I imagined the men, women and children about to embark for a long journey to hell, unaware of the horrors that were awaiting, unknowing that only a handful would survive the monstrosity of the concentration camps. My feelings in front of the Berlin Holocaust Memorial were so unexpected that I had to do some introspection. It was not ‘just another place’ and I had to understand why it did not win my heart. Meanwhile, I read a few articles and found out that almost from the beginning the Memorial raised quite a bit of controversy. Learning about the Holocaust Memorial controversy. 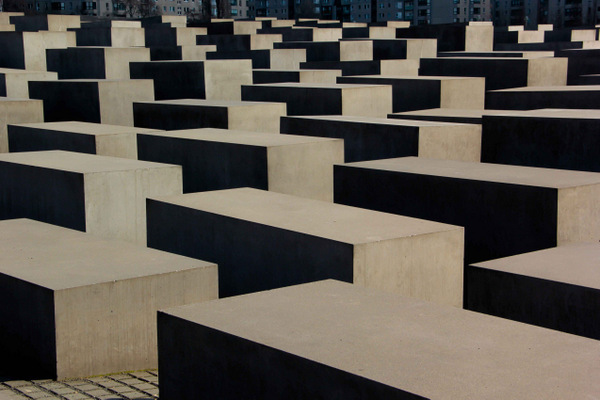 An interesting piece published on The New Yorker points out that the title given to the monument, ‘Memorial to the Murdered Jews of Europe’, might be confusing on what the commemoration is about, since there’s no direct reference to the Holocaust. Furthermore, the article highlights that the metaphors implied in the Memorial concept might be too broad, and thus confusing. More controversy stemmed from the fact that the monument is only commemorating the victims of the Holocaust, and does not include the persecutions for sexual orientation (therefore the Memorial to Homosexuals persecuted under Nazism erected nearby), as well as other killings, like the assassination of Rosa Luxembourg and Karl Liebeknecht in January 1919, as a consequence of their political marxist opinions and political involvement. As for me, I was impressed by the concept underlying the Berlin Holocaust Memorial, the way the stelae of different dimensions and their being totally bare point out at what was likely the greatest atrocity of the Holocaust: the complete annihilation of the human side of the Jewish people, first reduced to numbers and then to ghosts. I suspect that my lack of strong emotions was mostly due to the location of the Memorial, in one of the busiest areas of Berlin. I’ve written more than once about the importance of silence to me, and I felt like the remembrance of the Holocaust insanity required stillness. Only in an environment where there’s no space for distraction, I can reach a total concentration and deeply listen at my heart. 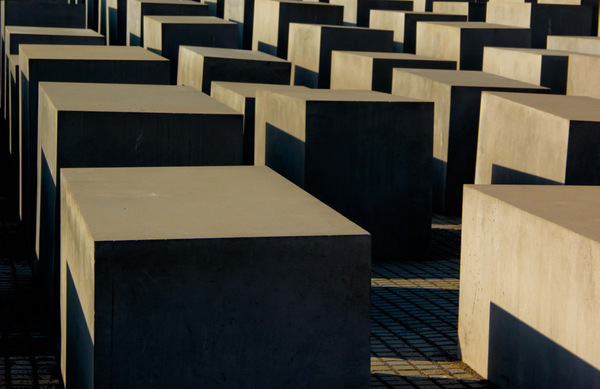 Have you visited Berlin Holocaust Memorial? What kind of feelings did it arouse? Agree. The memorial is vast and vague. Still, it is chilling to walk through. I’ve never been to Berlin, but some years back I accompanied my husband to Tergensee, south of Munich for a scientific conference. As we were leaving, on a train back to Munich, I looked out the window, and there, on a nearby track was a rusting cattle car of the type used on the death trains. I felt nauseated and my heart raced. I did not want to be there. 60 years was not long enough for me. Interesting post. I get what you mean about this memorial. I was also impressed by the scale of it, and I think it’s important that it’s just near the Brandenburg Gate, so that tourists come face to face with a memorial of the Holocaust. But for a bigger emotional impact head to the Jewish Museum and check out some of the spaces there. Thanks for stopping by and sharing your thoughts, Louisa. I haven’t been to the Jewish Museum and will certainly keep it in mind as a tip for my next visit to Berlin.